Car owner Bob Garbarino’s No. 4 Mystic Missile team is one of the true iconic rides in the history of Modified racing and part of the fabric that connects decades ago gone by with today’s racing. Though in 2017, for the first time in decades, Garbarino’s familiar car has been nowhere to be seen on the NASCAR Whelen Modified Tour. Garbarino’s team has been a fixture with the Whelen Modified Tour since its inception in 1985 and Garbarino possess three series championships, two with driver Donny Lia and one with Bobby Santos III driving his car. Garbarino’s car was last seen in action at the Whelen Modified Tour season finale at Thompson Speedway last October. Jimmy Blewett drove for Garbarino in 2016, but the two parted ways at the conclusion of the season. Now the question is, could Garbarino’s car be returning to action without his team? Garbarino confirmed to RaceDayCT Wednesday that he has loaned his car to Whelen Modified Tour regular Max Zachem. 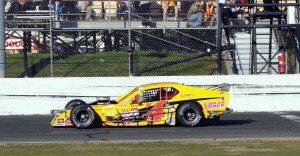 The Whelen Modified Tour competes in the Nor’easter 100 on July 15 at New Hampshire Motor Speedway. The division will also have its annual exhibition All-Star event on July 14 at the track. Asked if Zachem was planning to use his car for the All-Star event, Garbarino said he was unsure. “I don’t know, I don’t know what’s happening,” Garbarino said. Garbarino did confirm that he doesn’t currently have a NASCAR license and therefore could not at this time be listed as a team owner for an effort with his car. Qualification for the All-Star event is based on driver performance. Zachem has a reserved starting spot in the event based on his points performance last year on the Whelen Modified Tour. Zachem is currently fifth in the Whelen Modified Tour standings with three top-five finishes in the first six events this year. This young man is a Racer. He has done things the right way. Glad Mr. Garbarino is helping him out. The prez !!! Good for this guy hard worker makes it happen the right way like ray said…. shows great talent behind the wheel… smooth as glass … can’t wait to see him in action at the steel palace! Thanks, Bob, for believing in Max. He deserves this opportunity. With some $$$$ help, he could be a superstar. And he WILL take care of the equipment. I was hoping Max Zachem would pilot the Mystic Missile for the 2017 season. Would have been a potent combination. Good for Max. I remember stopping in at Lu Mac’s and seeing the trophies Max was winning racing quarter midgets up at the little t and talking with Ken about racing. I can remember when Max first drove mods on the tour and I would cheer for him and people had no clue who he was. Now I hear others in the stands rooting for Max and he deserves every one of them. I believe given the right opportunities Max’s talent will take him to many tour championships. Go Max !! Little help. I watch the videos of races at NHMS. It’s a big place for sure with a lot of seats but it always seems like no one is there. Cars racing, many times really good racing and no one is there to see it. I gotta ask, does the WMT get a good crowd? I know some of their races there have been terrific. Is it worth these other divisions showing up and racing to an empty facility? Doug, I think at least 1/2 of the Saturday crowd is there for the Modifieds on the Cup weekends. I would estimate the total head count usually at 25-30,000 people, depending on the weather. That race is ALWAYS the best race of the weekend. Wanna see 20-25 official (at the stripe) lead changes and at least that many unofficial lead changes in one 100 lap race? Go check out the Mods at Loudon! A class act the whole family the kid can wheel a race car go get it max. Fast Eddie speaks the truth. Many people leave after the Mod race. I do. I’ve been going to the NHMS races forever and I believe many people show up for the mods. The crowds fill in right before the mod race. The crowds have been huge, for real. Main grandstands full. I buy my reserved seat months in advance now. There can, and usually is, numerous lead changes within a single lap. Then you watch the fender cars and take a nap. Anybody else read the story on the NASCAR website with Zachem saying he’s excited to drive FOR Garbarino? Is this kid really that delusional? Even in the same story Garbarino says Max asked him to run the race and he said he didn’t want to do it with him. News flash kid, you’re not driving for Garbarino. He loaned you a car to drive. And we all know Bob is getting paid. Zachem is like the Michael Waltrip of Modified racing. A legend in his own mind and hasn’t won anything in his life but acts like he’s the next Richie Evans. Fake news Zachem style. My take is if you approach someone with the stature of Bob Garbarino and he allows you to use his car, you’re driving for him! Max has a couple of seconds and a couple of thirds on the tour; he’s knocking on the winner’s door. He has a first rate crew chief this year, and his “borrowed” car might be just the thing he needs to roll right through that door! AND, I’ve had the opportunity to talk to him a couple of times. My impression was he seems to be a humble hard working kid. Go get ’em Max & crew, whatever # you’re driving!! Zachem, Dowling and Swanson are the rising stars of the Mod Tour. Fast Eddie, if he was driving for Garbarino then Garbarino would be the owner of record with NASCAR. Max saying he’s driving FOR Bob Garbarino is like Woody Pitkat buying a 10-year old Joe Gibbs Racing chassis, entering the K&N race Saturday at Thompson and telling people he’s racing for Joe Gibbs Racing. It just makes Max look foolish trying to act like it’s something that it isn’t. He asked Garbarino if he could drive FOR him and Garbarino said no thanks. So obviously he’s not driving FOR Garbarino. I think there is more to this story than what is being published. Bob is a super guy and Max is a great kid however, I find it hard to believe that Bob just told him to take the car and do what you want to do. You just don’t hand the keys to your pristine ’69 big block numbers matching vette to someone without getting something in return to protect your investment. And a race car can get destroyed much easier so what happens then? I hope it all works out……..
Bob Garbarino states I do not have a Nascar license so cannot be listed as owner. Prince Charles this is probably why he is not the owner of record with Nascar. I’m not trying to split hairs, I’m just saying if a racing legend loaned or rented me his car, I would definitely feel like I was driving for him to some degree. It’s still his car whether he’s at the track or not, and I would feel honored that he thought enough of my team to do that. I’m guessing that was what Max meant by his comment. Unless I missed something other than what was said on Facebook which was very general, Max was unavailable for comment, Bob made all the statements. A guy like Bob Garbarino would not let just anyone use his equipment, rented, borrowed, leased, fee, free or otherwise. Donnie Lia and Jimmy Blewett destroyed plenty of Bob’s equipment in the past why would it matter to him now. guess it’s Bob’s way of contributing and giving back to the tour even though he’s not directly involved any longer. Do you actually know either of the parties involved here ? I remember Donny tearing up some stuff but I don’t recall Jimmy “destroying” any of Bob’s equipment. I do believe the Mystic Missile camp had two cars, an older Troyer and a new Troyer. The new car was a new Troyer as of the 2016 season, I think. I think Max’s car is new this year but I wouldn’t call Bob’s car “far from Brand new” as it was debut last year at the first Loudon race and has never been bent. If only folks knew the truth before comments are put forth. Well chaser, maybe if the truth was stated then all the people making comments would know! It does seem odd that a longtime very successful car owner who is not active on a tour that he has been for 31 yrs just says to a driver, here take my car and do whatever you want! I agree wmass. When you throw tid bits out there that is why people speculate about what is really going on. I think they just want to make certain they have two cars at their disposal just in case, one for each race and my guess the 4 will be for the all star race. After Lia destroyed two cars at Loudon in the same weekend, I think it is prudent to have two cars. Lia destroyed a Mystic Missile in the All-Star race, and then pretty much with the exact same move, destroyed Gary Putnam’s spare car that the Mystic Missile team borrowed to run the points race. Zachem is in points contention and they do not want to destroy their chances at a championship by putting the primary (only?) car at risk in a non-points all-star race. Running the all-star race is great experience and practice for the points race. Hence, borrow a car for the all-star race. You obviously have a issue with Max. Not sure maybe he turned down your advances or smoked someone you know who races cause you have definitely never been a racer. Everybody else who has commented has nothing but praise and wishes of good luck. Oh and if you want to be a smack talker on someone have the balls to use your real name. Go Max!!!! !